It has been a few weeks since the big guns in AMD’s Fiji line were released in late June (24th). The water cooled and flagship Fury X and the Fury with HBM blasted on to the scene with kudos and boo’s alike, similar to nearly all product releases, frankly. When these cards came out, its ‘little’ brother, the R9 Nano wasn’t anywhere to be found and wasn’t due to be released for a short while after that. But the time is drawing closer now and we have some specifications and information on the card we can share with your this morning! As some may know from the Fiij article we published in June, the Nano is a small form factor “ITX” sized GPU measuring in at ~6″. At the time, it was stated that the card will be “significantly faster” than the 290x. Speculation was all over the map on how AMD defined “significantly,” but we have some answers now, and should have the complete story (review) on its official September 10th launch day (AMD states there will be availability on that day). Before we get into those details (yes, that was a cliffhanger folks), take a look at the card, check out its specifications, and read what AMD had to say about it in our briefing. After taking a look at the specifications, slides, and pictures you can see that outside of the clockspeeds and typical board power (275W vs 175W), it has the same exact architecture as the Fury X. Same number of Stream Processors (4096), Compute units (64), Texture units (256), and ROPs (64). The clock speeds max out at 1000 MHz, versus 1050 in the Fury X as we see above, but this is during “lighter loads.” When you have heavy loads the clocks speeds will vary and go up to 950 MHz. The reason for this is the 175W board power “limit: that is on the Nano. The board will manage clockspeeds accordingly to match its board power limit. My suggestion is to raise that power limit out of the box to the let the Nano rip away. The temperature target is 75° C, but it will not throttle due to temperatures until 85° C. It is kept cool by a “new from the ground up” cooler with horizontal fins that work to minimize warm air exhausting into the PC, which help keep its small form factor small (think heatpipes that creep out over the top of the PCB). As far as thermals go, I personally look at the card and its single fan, see 175W, and think ‘that may be loud’. 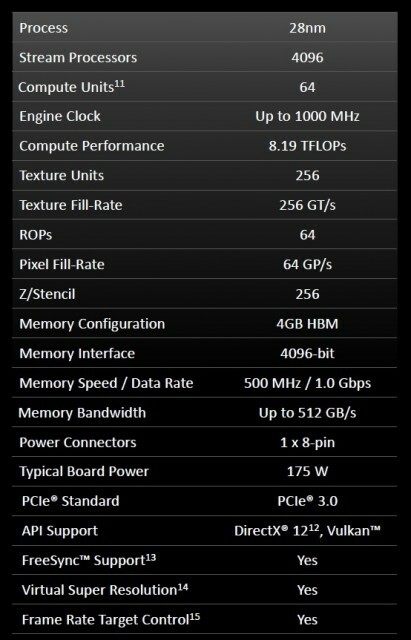 However, AMD states they shoot for a 42db target which is as quiet as a whisper. A pretty unique feature to this heatsink is that it gives the VRM its own heatpipe/sink, which helps with dissipating the heat load from that area of the card. So how does its performance stack up? A question was asked in the briefing about the delta between the Fury X and Nano considering its striking similarities. The answer was that it will more or less match the Fury as it sits. The 175W power target lowers the clocks accordingly to meet that limit is where the difference comes in. They mentioned that the 10% difference between Nano and the Fury X “would cost 50% power increase” which puts it right back up there at the 275W typical board power of the Fury X.
AMD set out to create a card that had the power of their flagship but in a small form factor, and it looks like on paper they certainly achieved this. Availability of the card will be September 10th. We hope to get a review sample from AMD and give you all the details you want to know. Keep a close eye out on the front page and forums! haha... Yeah. The $650 price tag is curious considering its performance. But Fury like performance is a pleasant surprise. Yeah, I mean if it has the same performance as a Fury but they are charging an extra $100 for a smaller power profile and smaller size, I think it will largely fall on deaf ears (depending on how loud the fan is :p) when it will be blown away by the 980ti at the same price point. That's pretty good, are they going to be the sole-maker of them like the furyX or will AIBs come out with custom solutions? Nice write up. One question though, the article mentions it's only 6" long but is it a full height GPU? Looks like it'd be perfect for a HTGPC if it was a shortie and not >$600. $649? Hmmm I'm a little disappointed now. I had heard it might have been as low as $400, which looking bad is a rather silly thought. Still though it's the same price now as the Fury X and it will run hotter and wont maintain the same clock speeds consistently. So this just looks super niche to me. 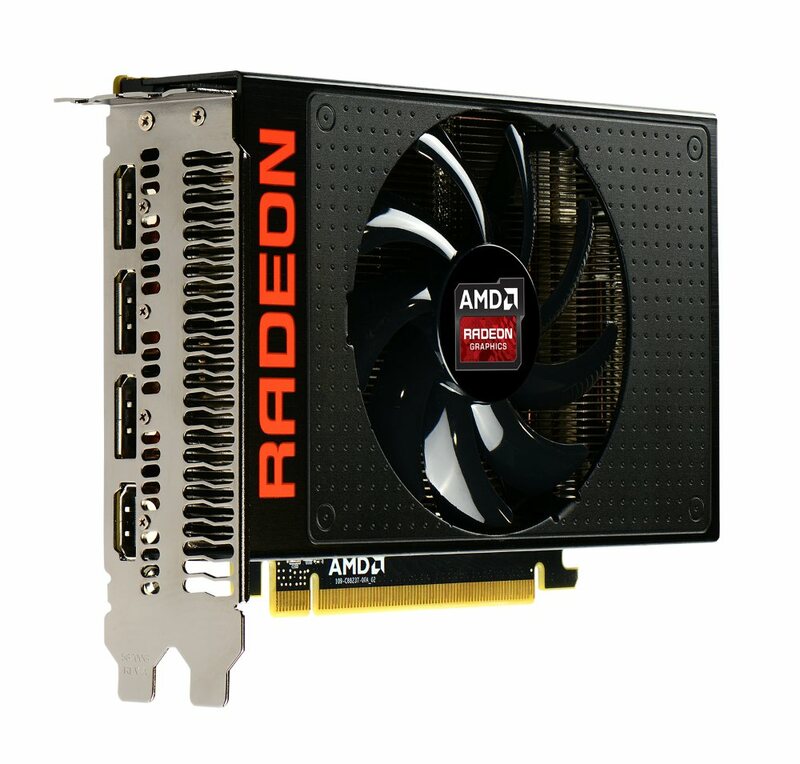 PS: AMD needs more Fury cards in stock, and a larger lineup. I'm tired of all of these confusing rebrands for the past three years. Not a fan of the price. I'm not sure what it will do on the extreme side though. I don't have any FuryX's in just yet. I should have a couple next week though. If they drop this on the market @ $399~$425 then this is a great product. If they stick with the $600+ range with this card, then it will be a failure. This card HAS to stay below 175 WATTS and a 75/85c temp range, while the R9 Fury does not. I believe that in a Overclocked head to head comparison between the R9 Nano and the R9 Fury, that the R9 Fury would win. R9 Nano is FuryX crippled. I bet if you add in the right amount of power, it will be a FuryX. Problem is, I could buy a FuryX for the same price as a Nano. Everybody who has commented so far clearly aren't the target market for this card. This card is for tiny cube cases that won't fit a full-length card, not towers where you would just get the normal Fury. How much it costs compared to Fury or Fury X or 980 Ti is totally irrelevant. How much is costs compared to other cards of the same length is relevant. the itx 970 is around $350, no? Is almost 100% difference for 30% performance gains still worth it? I personally feel that pricing should be based off of relative performance, not size. But even then, it's still overpriced. It is the unique size AND performance that make it worth that premium for the itx crowd. If you're working with ITX, then it might be. The smaller you go, the more every notch on the performance scale costs. Same thing applies to laptops, tablets, routers, etc. You are saying people will pay more for a graphics card because it is smaller but performs like the larger ones? That makes me think of the old saying that there is a sucker born every minute. Also, people building little pcs usually build them silent and that fan will alienate that crowd. I see no point for this card to exist...at least at that price range. Sadly, I was excited about the initial news of this card but as usual AMD has let me down. You are saying people will pay more for a graphics card because it is smaller but performs like the larger ones? That makes me think of the old saying that there is a sucker born every minute. People who pay more for lithium AA batteries instead of alkaline D batteries must also be suckers. Gonna need a bit better reasoning there. Who are those people? If I want silent, I need room for either tower heatsinks or water pumps and radiators (and large fans to go with either one). If you're even thinking about putting a discrete GPU (and the subsequent heat) in an ITX case, you're not building for silence.